Akront Green & White Oval Stickers. Set of 4. 1.25". Bultaco Alpina Yellow & Black Cut Text Stickers. 1.5" Pair. Bultaco Espana Spanish Flag Style Stickers. 2" Pair. Bultaco Red & Yellow Circular Stickers. 2" or 2.5" Pair. 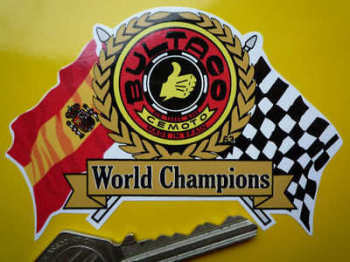 Bultaco World Champions Flag & Scroll Sticker. 4". Bultaco Yellow & Black Cut Text Stickers. 8" Pair. Bultaco Yellow & Grey Circular Stickers. 2.5" Pair. SuperBike Magazine Shaped Sticker. 8".